ELO Engineering, Inc. has decades of experience providing metal powder coating and liquid painting for a wide range of manufactured parts. We’ve invested millions of dollars in both staff training and equipment to ensure that our work is done with nothing less than total precision. Additionally, we’re an affiliate of Demmer Corporation – a leading, vertically integrated aerospace and defense manufacturer – and have access to many of the best machines and most knowledgeable experts in the manufacturing industry. 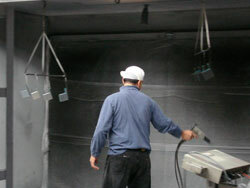 ELO has far more than just metal powder coating and painting capabilities. We’re an experienced provider of turnkey parts solutions for businesses in a wide range of sectors including, transportation, agriculture, aerospace, medical and more. We offer a full range of sheet metal forming and fabrication services and CNC machining, with a focus on using lean manufacturing principles to lower costs for our customers. We also provide engineering support to improve the functionality and further lower the cost of your components. Our staff understands that it’s as important to have your parts when you need them as it is to have them built to print, which is why we use integrated productionforecasting to ensure on time deliveries. For more information on our metal powder coating and liquid painting capabilities, or to request a quote for our production services, contact ELO Engineering, Inc. today.